The scrapbook will be archiving a 'running' narrative of our progress. 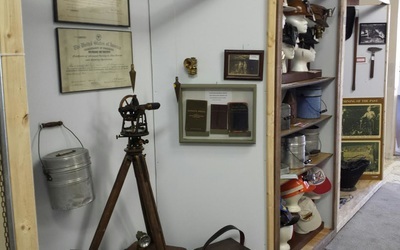 In the interest of keeping our 'exhibits' page looking fresh and easy to view, this new entries to the scrapbook will be added from the top. To start at the beginning, page down to the bottom of the page. 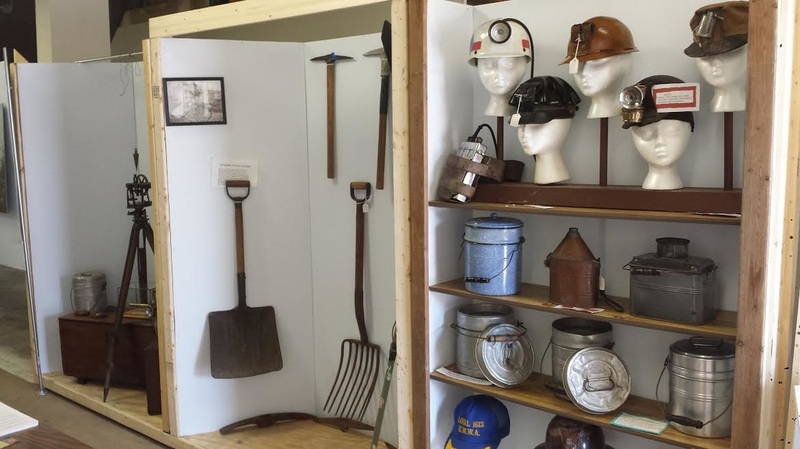 The Miner's Wash House, Mine Safety and Mine Rescue, 'Dynamite' and the Roy Hoehn, mining engineer display were outlined - awaiting more graphics, photos and labels. 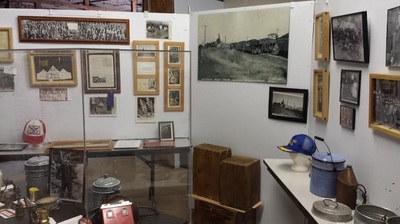 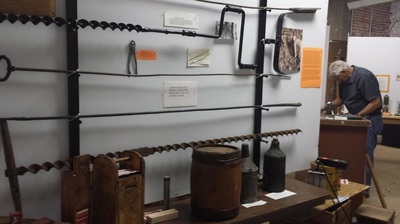 From mid June to thru July, the crew continued building repairs to gain usable floor space and reluctantly dismantled some of the temporary displays. 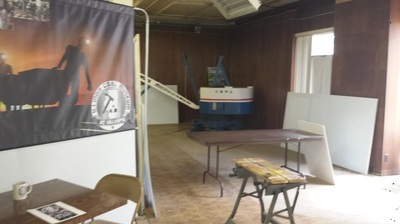 The borrowed banquet tables were returned to the Gillespie Civic Center (Thanks for the loan!) 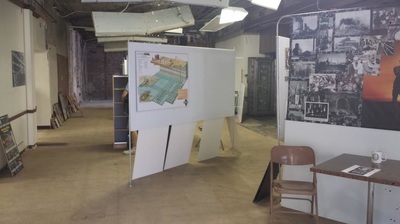 and work began on actual display concepts. Visitors will now notice a more refined entry and have a glimpse at look at things to come. In less than a week of part time labor, the displays are offered to the public 6/10, 11. 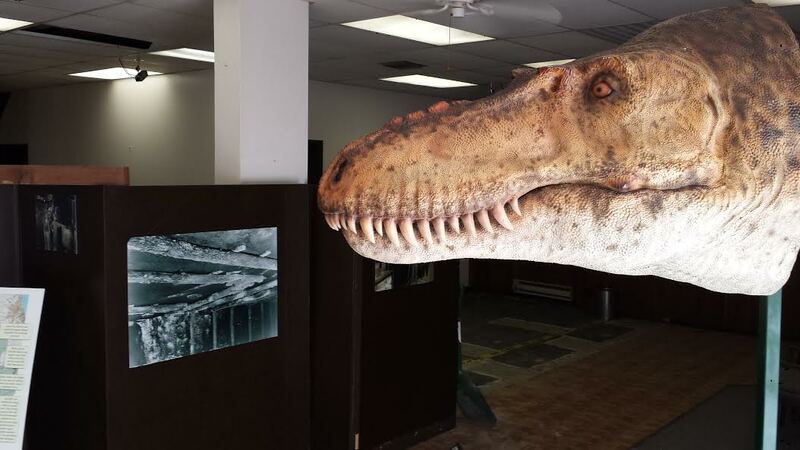 ​Now we turn to the transformation of the museum prototype into completed exhibits. 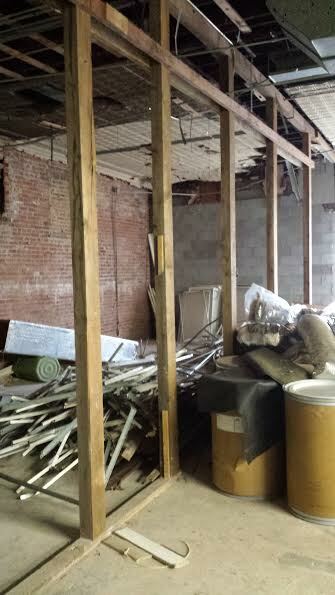 This will be a gradual progression linked to our fundraising efforts and the building remodeling. 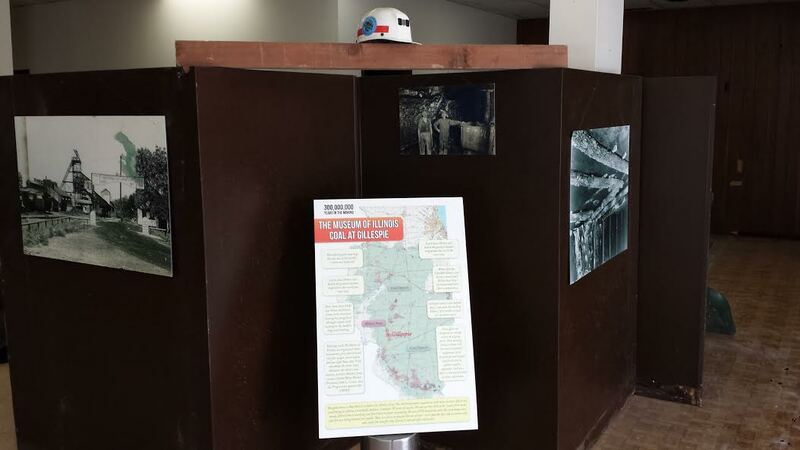 The construction of inexpensive self supporting walls form the backbone of our temporary displays. and banquet tables are place holders for display cabinets. 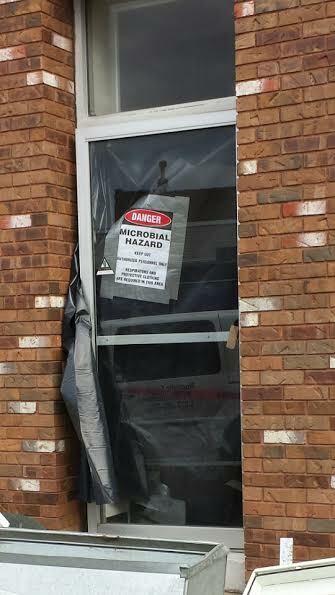 The building clean up has been completed and received a clean bill of health. 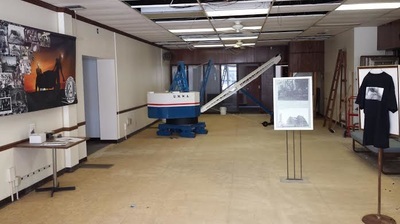 Access was granted 6/3 and display construction began about 24 minutes later. 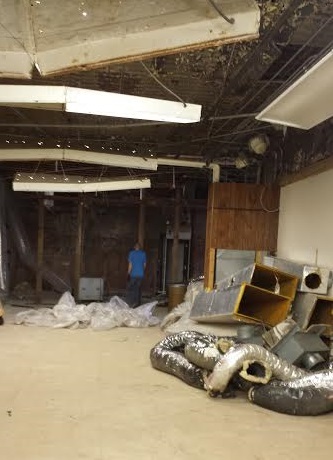 The Environmental Resources Inc. professionals immediately uncovered even more damage and more demolition to be completed before the actual mold abatement and asbestos removal could begin. At each stage of the building demolition proceeded more damage was discovered. 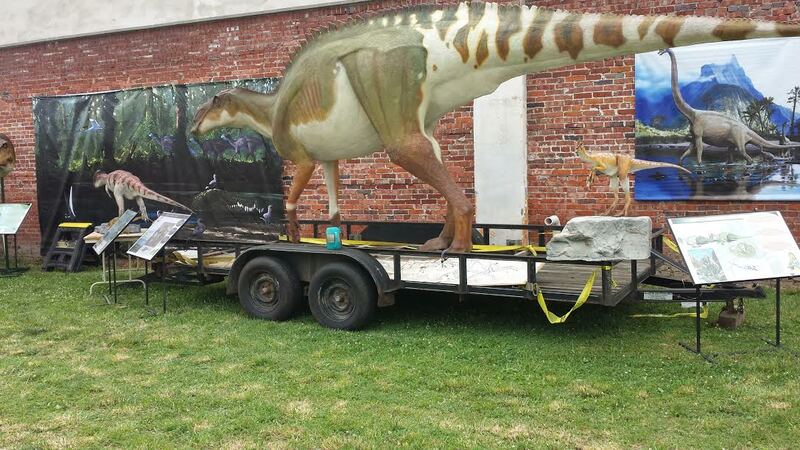 Twelve vacant years took a great toll. 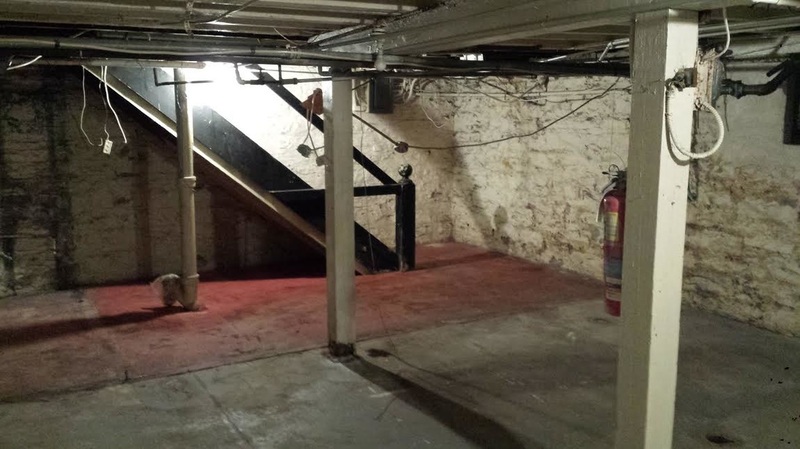 March demo completion finally brings a May clean-up. A quick mock up was called for to offer a preview of our progress to a group of out of town visitors. 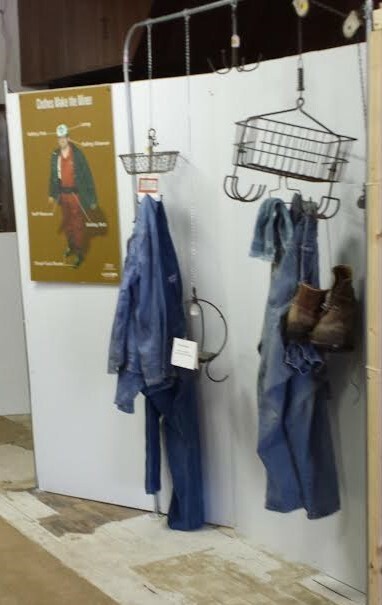 These items are already put away - back to the demo! of all banking fixtures and the damaged carpet and ceiling tiles. 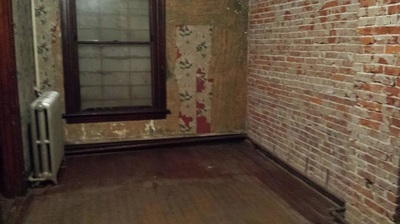 ​3752 square feet of potential. The City of Gillespie acquires the old United Community Bank with the idea of repurposing an empty, downtown building. 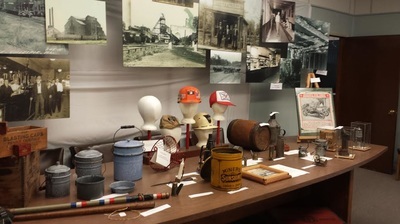 Along with offering the museum a home, updated and enlarged city offices and city council chamber are under consideration. 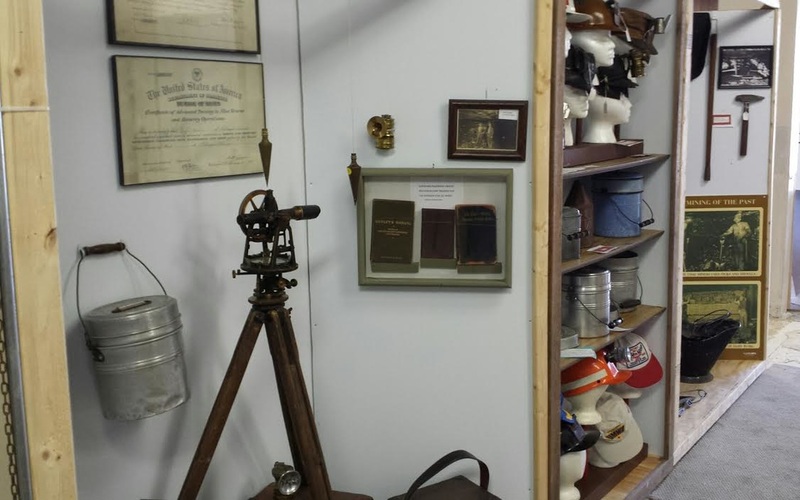 ​2015 ends with little more progress. 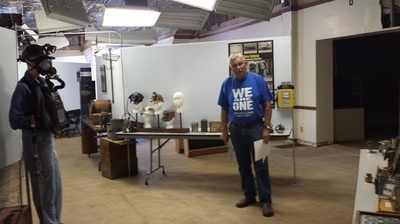 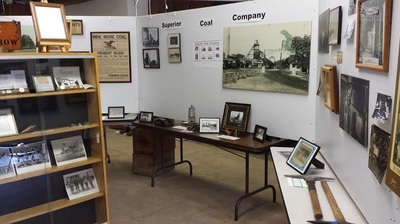 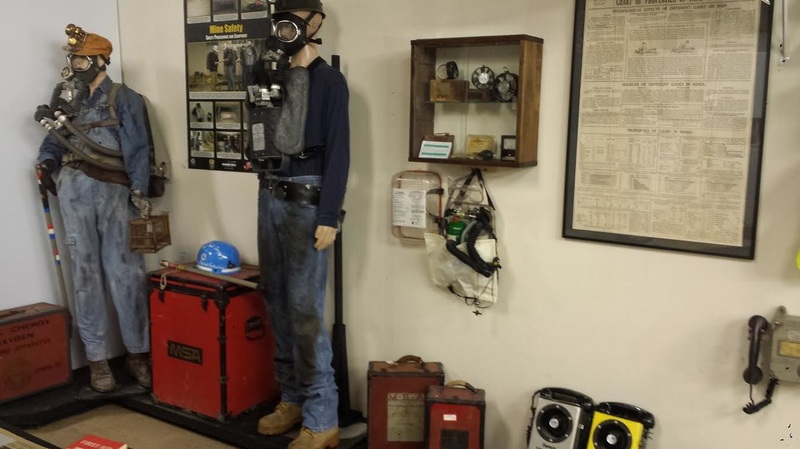 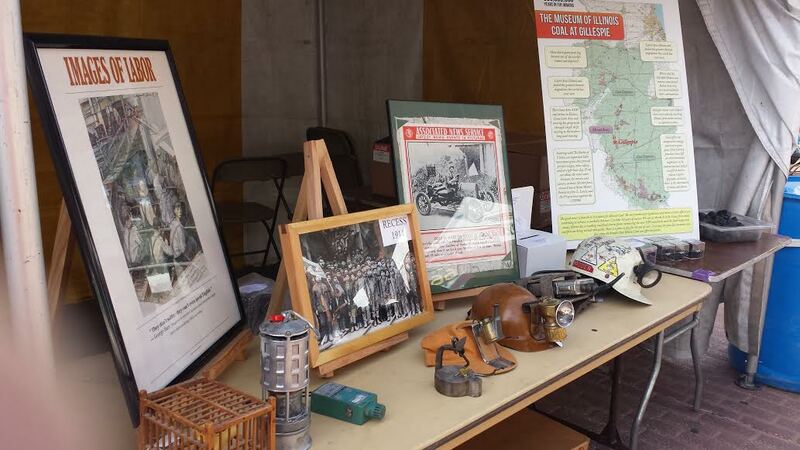 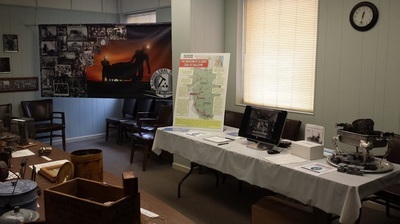 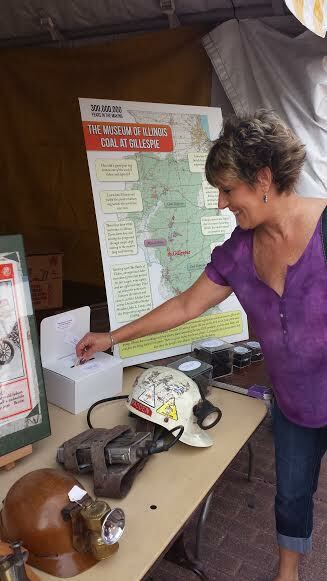 Jim Alderson offers a small selection of his extensive coal mining memorabilia to hundreds of visitors at the 13th annual Mother Road Festival in Springfield, 2014. 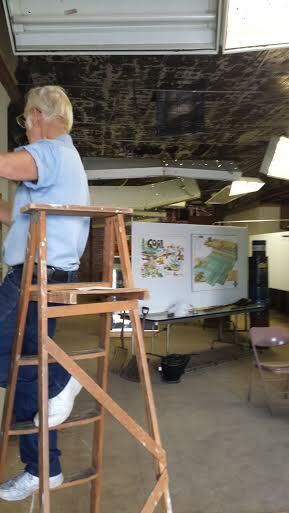 The Gillespie downtown beautification begins. 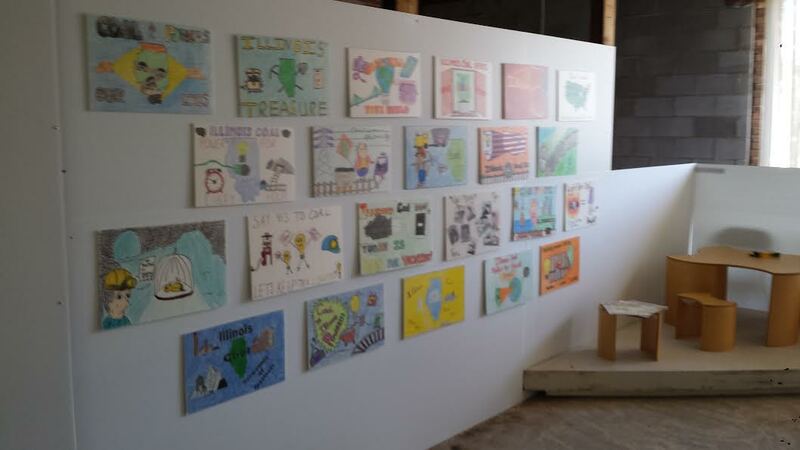 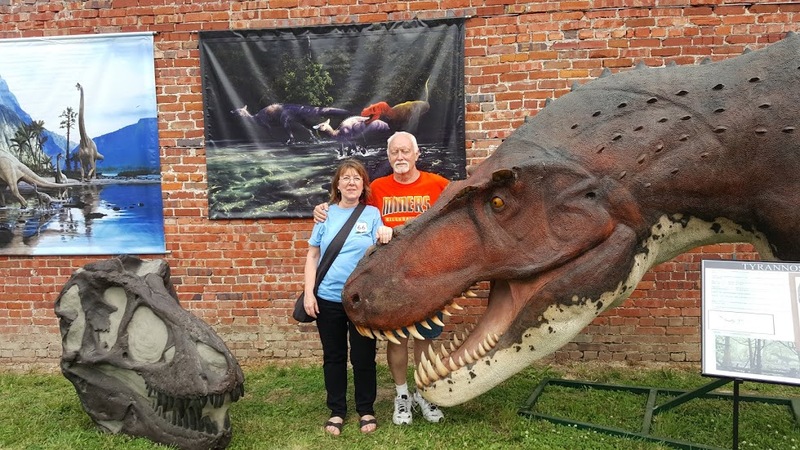 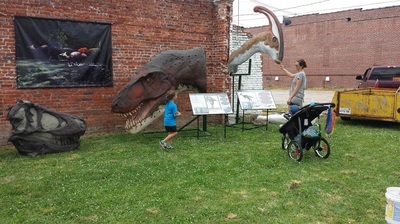 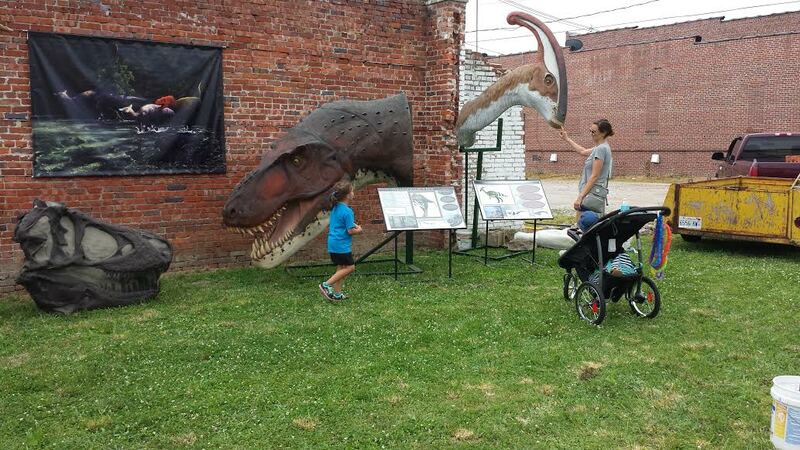 A year later, at the inaugural Route 66 Blue Carpet Corridor Festival the expanded traveling coal museum found a home in the city council chambers, Gillespie's first mural was unveiled, and dinosaurs roamed S. Macoupin. Jim Alderson was joined by local coal mining historian Wayne Hinton at the coal mining display to greet the visitors and talk coal. Brian Page from CM Studios donated the dinosaur photo op donations to the museum fund.